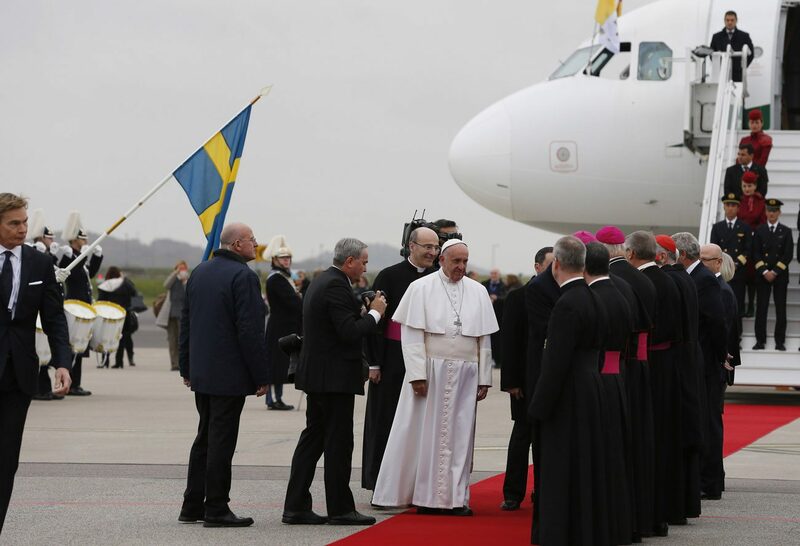 MALMO, Sweden (CNS) — Under a thick gray sky, Pope Francis was welcomed to Sweden with a small formal ceremony, which conveyed by its brevity that the trip was not a formal state visit, but had another purpose. Arriving at the Malmo airport, he was greeted by Swedish Prime Minister Stefan Lofven and by Archbishop Antje Jackelen, primate of the Lutheran Church of Sweden, as well as by the country’s lone Catholic bishop, Bishop Anders Arborelius of Sweden. A military band played the Vatican and Swedish national anthems as the pope and prime minister stood facing Sweden’s flag, which is blue with a yellow cross. Members of the general public were not present for the welcoming ceremony. The pope met briefly in an airport VIP lounge with Prime Minister Lofven before traveling to Igelosa, a medical research center outside Lund, which transformed a room in its conference center into the papal residence for his 26-hour stay in Sweden. After an early lunch, Pope Francis was to travel to Kungshuset in Lund for a meeting with King Carl XVI Gustaf and Queen Silvia and their children and grandchildren.